Offer the special people in your life this Passionate Season's Greetings Collection and make their hearts leap in joy. 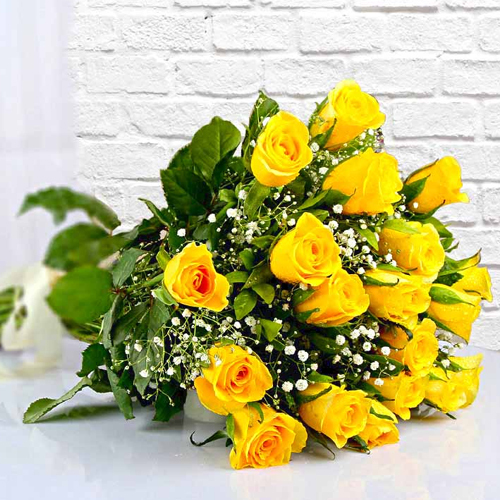 This Flowers Bouquet comprises of 18 Yellow Roses enriched with Fillers and enfolded with Tissue. Flowers Delivery Tirunlveli, Send sweets Satna, Wedding Cake Pollachi, Diwali Mithai Bhillai, Send Flowers and Gifts to Bhopal, Online Shop Panjim, Flower to Mysore, New Year Flowers Thanjavur , Fresh Fruits Tirupati, Send Gift Durg, Dry Fruits to Ongole, Birthday Delivery Guwahati, Sending to Muzzafarnagar, Flower shop Shantiniketan, Jamnagar Online Cake Delivery.